A new development in the Roanoke Virginia area featuring EarthCraft homes. Imagine a simplified life, where there is time for family, friends and self. 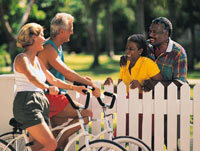 Here, residents can live, work, play and shop all within walking distance. Sidewalks are the gateways to interaction and exploration, conveniently connecting residents to each other, to town center, to parks and other public spaces. A vibrant town center will offer everything you need for your daily lifestyle: shops, restaurants, offices, outdoor events ...and so much more. Radiating from town center will be a wonderful collection of homes inspired by classic tradition and inventive design. There are 5 core architectural styles, yet each home will be unique. All are EarthCraft Gold certified, meaning they are extra energy efficient. A variety of sizes and price ranges encourage the cohesive strength that comes from diversity. Daleville Town Center is ideally situated in the Roanoke Region, where you will find a perfect balance between outdoor recreation and urban amenities. Roanoke is the largest metro city in Western Virginia, offering arts and culture, shopping and restaurants. A recreational wonderland, the region features some of the best cycling, fishing, water sports and hiking in North America. In fact, an Appalachian trailhead leading to such iconic vistas as Tinker Cliffs and McAfee's Knob is barely two miles south on Rt. 220. 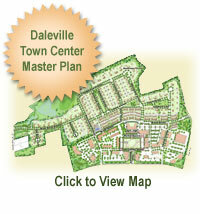 A community like no other in southwestern Virginia, Daleville Town Center serves a higher purpose, so you may live your dream.